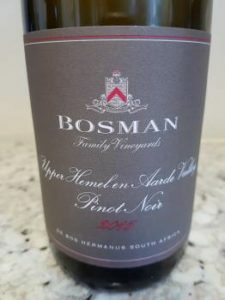 Two new wines from the Upper Hemel-en-Aarde vineyards tended by Bosman Family Vineyards. Matured for nine months, a third in new French oak, the rest in tank. Pear, white peach and citrus. Pure fruit and bright acidity with very little oak in evidence making for a particularly light and pretty wine. Matured for nine months in French oak, one third new. Cherries, strawberries, musk and spice plus a not unattractive hint of reduction. On the palate, wonderfully pure fruit, zippy acidity and silky tannins. Light in body and fine to the point of fragile in structure. More charming than quite a few more expensive local versions of the variety.